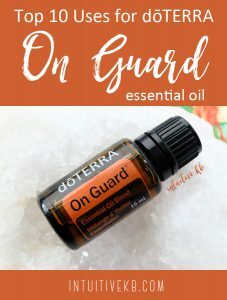 dōTERRA On Guard essential oil is one of dōTERRA’s most popular blends, and my very favorite dōTERRA product. I credit it with igniting my passion for essential oils and inspiring me to start a dōTERRA business. Once you learn all the incredible uses for On Guard, you’ll never be without it. What makes dōTERRA On Guard so special besides its amazing aroma? For starters, this oil blend has a powerful impact on our immune system. On Guard’s blend of sweet orange, rosemary, clove, cinnamon and eucalyptus work together to create an effective holistic product that wards off infection, supports the body’s natural defenses and promotes healthy circulation. It can also be used as a non-toxic cleaner that makes your home smell warm and inviting. Boost your family’s immune system by adding 3 – 6 drops of On Guard to a diffuser in your main living area. This is especially effective if one of your loved ones is sick. Make your own non-toxic cleaner by adding 20 drops of On Guard to a glass spray bottle with 1 cup of warm water and 1 cup of white vinegar. Use on counters, doorknobs, glass, stainless steel or any other surface to clean and sanitize, or use the On Guard cleaning concentrate. For a healthy, immune-boosting snack, soak apple slices in water with a few drops of On Guard and enjoy. Create your own immune-boosting supplement by adding 2 – 3 drops of On Guard in a veggie capsule, or take an On Guard beadlet. Soothe a sore throat by swallowing 2 drops of On Guard mixed with 1 drop of lemon essential oil and a teaspoon of honey. You can also gargle with 1 – 2 drops of On Guard mixed with warm salt water, or enjoy an On Guard throat drop. Freshen your car and enjoy your commute by adding 2 – 3 drops of On Guard to a car diffuser. To fight a cold and support a restful sleep, add 2 – 3 drops of On Guard to a 5 ml roller bottle along with fractionated coconut oil, then roll onto the soles of your feet (or use the pre-made On Guard Touch roller). Create your own non-toxic hand sanitizer by rubbing your hands together with 2 – 3 drops of On Guard (or use doTERRA’s On Guard hand sanitizing mist). Clean and sanitize your toothbrush by soaking it overnight in warm water mixed with 2 – 3 drops of On Guard. I also highly recommend dōTERRA’s On Guard toothpaste! Make your clothes smell amazing by adding 3 – 4 drops of On Guard to 3 wool dryer balls (3 – 4 drops of essential oil per ball) and place them in the dryer with your laundry, or try dōTERRA’s On Guard laundry detergent. On Guard essential oil blend is an exclusive product sold only through dōTERRA, so it’s not available in stores. You can purchase it at the full retail price on dōTERRA’s website, or at 25% off by becoming a wholesale customer or Wellness Advocate. When you join dōTERRA through my link, you’ll receive an exclusive welcome package including ongoing support, a welcome gift, access to our supportive Facebook community and access to a private website full of resources. If you have any questions about On Guard, essential oils or dōTERRA, email me personally at kb@intuitivekb.com or leave a comment below.